Its starting to get chilly here in the Northern Hemisphere and it’s time to consider what special considerations our horse(s) need to stay healthy and comfortable during the rainy and/or snowy months. When deciding what to do for your horse, keep in mind the natural protections that the good Lord gave them and be careful not to interfere with their natural processes. Here are some helpful hints and tips on cold weather horse care excerpted from an article by Cherry Hill, author of more than 30 books and videos on horse care. Even though a horse may be “turned out” for the winter because he is not in active work, he needs protection from wind, moisture and cold. Whether you blanket your horse or not depends on many factors including his condition, his activity level, his hair coat, his level of nutrition, and the protection. Actually, preparation for winter begins well before the first snow. In August and September, horses living in temperate climates should be allowed an increase in body weight of about 5%, but not more than 10%. A 1200-pound adult can gain 60-120 pounds in the late summer or early fall. This extra flesh and fat will provide added insulation and an energy and heat reserve for when weather is particularly bad. During cold weather, rations should be increased to counteract environmental stresses caused by wind, freezing rain, snow, sleet, and below-freezing temperatures. The hay ration should also be adjusted to compensate for low temperatures. For every ten degrees Fahrenheit below freezing, the ration should be increased 10%. Horses fed less than is necessary to combat cold and wind will burn fat and muscle tissue by shivering to keep warm and they will lose weight. A horse’s shelter requirements are fairly basic – a place to get out of the wind and wet during cold weather. It is not necessary or desirable to have an air-tight, heated barn for horses. In fact, that is one of the unhealthiest environments in which a horse can live. A cold, but not drafty, barn is healthier. Most horses begin shedding their summer hair in August and start growing thicker winter coats. In order to produce a dense, healthy coat, a horse’s diet should provide an adequate quantity and quality of protein. A normal winter coat has as much insulating capacity as most top-of-the-line blankets. The downward growth of the long hair coupled with the stepped-up production of body oils allows the winter coat to shed water and keeps moisture away from the skin. A dry horse has a much better chance of remaining a healthy horse. A healthy horse can withstand temperatures well below freezing as long as it is sunny and the air is still. The winter coat absorbs heat from the sun and the horse’s body and traps it next to the skin. During cold temperatures, pilo erector muscles make the hair stand up which increases the coat’s insulating potential. Wind separates the hairs, thereby breaking the heat seal which results in a great loss of body warmth. Snow showers, sleet, and the freeze-and-thaw typical of many northern areas are particularly hard on horses. A wet hair coat conducts heat away from the horse many times faster than a dry hair coat. In addition, wet hair tends to become plastered close to the horse’s body, nullifying the air insulation potential of a fuzzy, erect winter coat. A horse with a long winter coat should receive minimal grooming – a rudimentary “dusting off” or vacuuming of the hair ends. Vigorously currying a winter coat can disrupt the natural protective layer of oils which is essential for protection from moisture. After riding, rub the coat dry with a cloth or gunny sack or allow the horse to roll in sand or dry snow. A fuzzy winter coat can make it difficult to determine condition by visual inspection alone. The round teddy-bear look can be deceiving – it makes even an underweight horse look like it is in proper flesh. Feel the rib area for a moderate fleshy cover once a week throughout the winter. Some horses may require the use of a blanket during the winter: the show horse, the clipped horse, the southern horse that moves north during the winter, and the old. Blanketing adds expense and labor to the winter care routine. Blanketed horses must be meticulously groomed on a regular basis to minimize rubbing and rolling. Proper blanket fit is paramount. Blankets that are too small can rip or cause rub marks and sore spots on the withers, shoulder, chest, and hips. Too-large blankets can easily slip and twist, possibly upside down which can cause the horse to become dangerously tangled and the blanket mangled. Blanket linings should be of a smooth material to prevent damage to hair, such as the mane near the withers. Waterproof blankets keep precipitation off a horse but often do not allow heat and moisture from normal body respiration to escape. A better choice is a waterproof-breathable blanket which prevents rain and snow from entering the blanket but allows moisture to escape. A too-heavy blanket can cause a horse to sweat, become wet, then chilled. This can sap a horse’s energy, lower his resistance, and create an open invitation for respiratory infections. Check for over-heating or dampness by slipping a hand under the blanket at the girth and flank areas. Most horses in the temperate climate of the Pacific Northwest only rarely need a blanket, if you let their natural coat grow out for the season. If you do decide to blanket and your horse is turned out in a herd, expect that you will need to do regular repairs and/or replacements. Horses will tug and tear at the blanket when playing with each other in the pasture. Do not forget that water is also a concern during the winter, not just the summer. Horses will drink large quantities on cold, windy days. If you ever were out skiing or hiking on a cold windy day, you probably noticed how good that beer or hot chocolate tasted when you came back inside or how dry your skin became. The wind is a big factor in wicking away body moisture. Make sure your horse has easy access to water throughout the day. Do not worry about the water being cold. Recent research has shown that horses actually prefer the cold water. Just be sure to break up any ice that may form and double-check any tank warmer or electric fence near a metal trough to make sure it is not putting electricity into the water. If you are feeding your horses orchard grass, you may want to consider switching over to timothy hay or an orchard/alfalfa mix in the cold months. This will provide them a bit more energy to help ward off the cold. It will also help reduce the amount of hay you need to provide to compensate for the increased energy demand required of your horse to stay warm. Also consider adding a bit more grain to their daily ration or providing a high-energy supplement to help with the increased need for energy and to maintain a healthy weight. 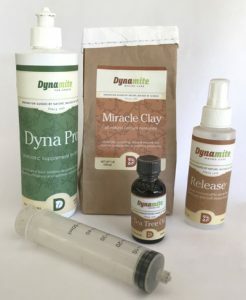 Here at the Northwest Natural Horsemanship Center, we prefer the benefits of a quality, organic soybean-based supplement such as Dynamite HES rather than beet pulp. However, beet pulp can be a good alternative if a horse owner is on a tight budget and is not sensitive to GMOs or agricultural chemicals in their horse’s food. The fluctuations in temperature this time of year can also bring on colic. Be sure to keep an eye out for early signs and get on it right away. Here is the first-aid protocol we use here at the Northwest Natural Horsemanship Center. It has been a life-saver and vet-bill saver for many years. Utilize these products as a part of your colic first aid protocol. Step 1: Listen for bowel sounds in the left lower abdomen and right upper abdomen. You should hear gurgling signs. With colic you will not. 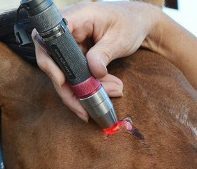 Step 2: Draw 10 – 20 cc of Dyna Pro prebiotic into a syringe and squirt into the horse’s mouth. Step 3: Take approximately 1-2 tablespoons of previously activated Miracle Clay, put in a cup and add water to make a muddy water solution. Draw 10 – 20 cc of the mixture into the syringe and squirt into the horse’s mouth. Step 4: Apply photonic (red light) therapy to the recommended colic relief meridians. Step 5: Use a cotton ball or finger tip to place a small amount of Tea Tree Oil(undiluted) on the horses belly button. More is not better in the case of tea tree oil. CAUTION: Tea tree oil is very strong and may cause the horse to kick out. Give yourself an escape route and stand back from the horse after application. Step 6: Wet the horses belly with a cloth, spray Release homeopathic spray on the abdomen, and rub briskly to help relieve cramping pain. Step 7: Repeat steps 1 – 4 every ten minutes. Positive results can often be seen within 20 – 40 minutes. You should start to hear abdominal sounds. Should the horse’s appetite return, try to feed on grass, not hay. Watch for bowel movements. CAUTION: This protocol will not be effective if the horse has an obstruction or “twisted gut.” Monitor horse closely and call veterinarian if symptoms persist or become worse. Here’s to a safe, healthy and fun winter season with your horse!